Which State Has the Cheapest Gas? Hint: It’s not the one you probably think. The average American uses 656 gallons of gas every year, according to the most recent data. Given that the average price of gasoline last year was $2.15 per gallon, that works out to about $1,400 per person. However, some Americans paid well above average because they live in a state with higher gas prices. For example, residents of the tropical paradise of Hawaii currently pay the highest price in the country at $3.07 per gallon, which is well above the recent national average price of $2.28 per gallon. Meanwhile, residents of the great state of South Carolina, where I live, are paying a mere $2.05 per gallon. That dollar-a-gallon difference really adds up, with us lucky South Carolinians paying roughly $650 less per year than our Hawaiian counterparts. There are several reasons residents in some states pay more while others have access to relatively cheap gas. Crude oil, which fluctuates with oil prices. Refining, which is the margin earned by refiners such as Phillips 66 (NYSE:PSX) and Valero (NYSE:VLO) to turn crude oil into gasoline. Distribution and marketing, which are the fees logistics companies charge to transport gas from refineries to retail stores, as well as the markup on gasoline by retailers such as Sunoco LP (NYSE:SUN). Finally, taxes, which get tacked on to the price at both the federal and state levels. While every gallon of gas has these costs embedded in its price, not everyone pays the same amount on a per-gallon basis. That's why residents in states such as Hawaii pay much more than those living in South Carolina. Let's break it down even further to see why these costs differ by location. Therefore, states that use more imported oil, such as Hawaii, pay higher prices than those consuming lower-priced oil. 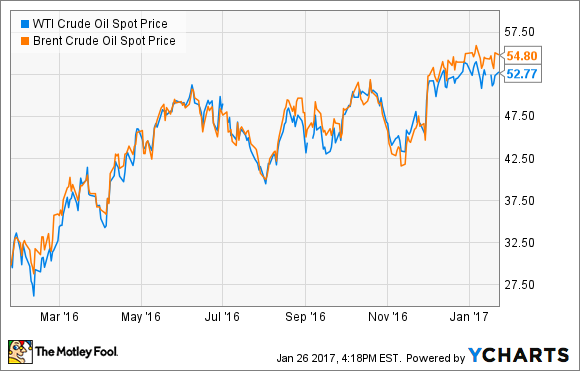 It's one reason both Valero and Phillips 66 are investing heavily to increase their access to domestically priced oil. Another factor driving up the cost of gas in some states is the expenses associated with refining gas to meet their standards. California, for example, has higher standards for gasoline than the federal government, as it mandates the use of gas that produces fewer emissions. The state requires refiners to use a special oxygenated blend that not only costs more to make but that few refiners also have the capability to make. That became a big problem last year, when an explosion damaged an ExxonMobil (NYSE:XOM) refinery in the state, causing a shortfall of gas and higher prices. These environmental laws are the driving cause of California's high gas prices. Hawaii's high gas costs also have a lot to do with higher refining costs, but not for the same reason. The state has much higher electricity costs, running 200% to 300% more than states on the mainland, which increases refining costs. One more cost associated with the price of gasoline is its transportation from refineries to gas stations, with shipping costs increasing the farther the gas needs to travel. For example, while Alaska is a major oil-producing state, it just has one smaller, less-efficient refiner, so it needs to import gas from refineries along the West Coast. Those transportation costs make its gas among the most expensive in the nation. Meanwhile, states along the Gulf Coast, such as Texas and Louisiana, have some of the lowest gas prices in the country, because they have plenty of refineries in their own backyard. Another reason Hawaii's gas is so costly is the overall higher cost of living in that state, which includes more expensive land and building costs. For perspective, in late 2014 Sunoco LP acquired Aloha Petroleum, which is the state's largest gasoline marketer and one of the biggest convenience-store operators. In that deal, Sunoco paid $240 million to acquire 100 gas stations and six fuel storage terminals. Contrast this deal with one Sunoco completed about a year later, when it bought 120 convenience stores in eastern Texas and Louisiana for $53 million. While not exactly an apples-to-apples comparison, it does imply that physical gas stations cost more in Hawaii when compared with states with lower gas prices. Taxes can also have a significant impact on what drivers pay at the pump. Drivers in South Carolina, for example, pay slightly less than $0.17 per gallon in state gas taxes. While drivers in both Alaska and New Jersey pay less in state gas taxes, they pay more for their gas than those in the Palmetto State because Alaska has higher transportation costs and New Jersey has a statewide ban on self-service gas stations. Meanwhile, residents of both Oklahoma and Arizona pay less than $0.20 per gallon in state gas taxes, which is why they're also among the cheapest states to fill up. On the other side of the spectrum is Pennsylvania, where drivers pay a whopping $0.505 per gallon in gasoline taxes. Meanwhile, Connecticut, California, and New York all pay above $0.45 per gallon. Unsurprisingly, the average gas price in these five states is well above the national average. Just as with real estate, what you pay for a gallon of gas comes down to location, location, and location. Some states pay less because of proximity to refineries or lower taxes. Meanwhile, living in a state with higher taxes, higher standards, or greater distance from a refinery can cause more pain at the pump.